"How do I transfer MP3 to iPod touch? – I’ve got several wonderful songs ripped from my CD with .mp3 extension. I want to add MP3 to iPod touch so I can enjoy them on the long train journey. 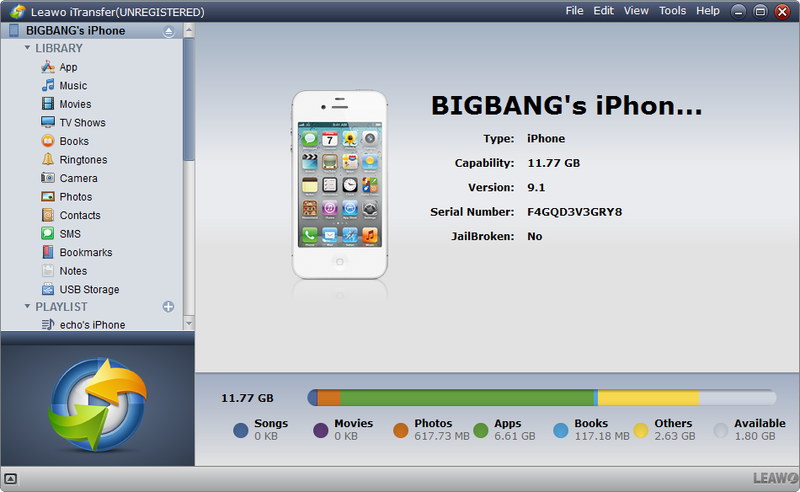 How can I transfer MP3 to iPod touch? " By Johngfabling. from Apple Support Communities. Although newer versions of the iPod are capable of playing videos and running applications, the iPod is still primarily a music-playing device. With iTunes installed on your computer, you can add MP3 to iPod Shuffle, iPod touch, etc. 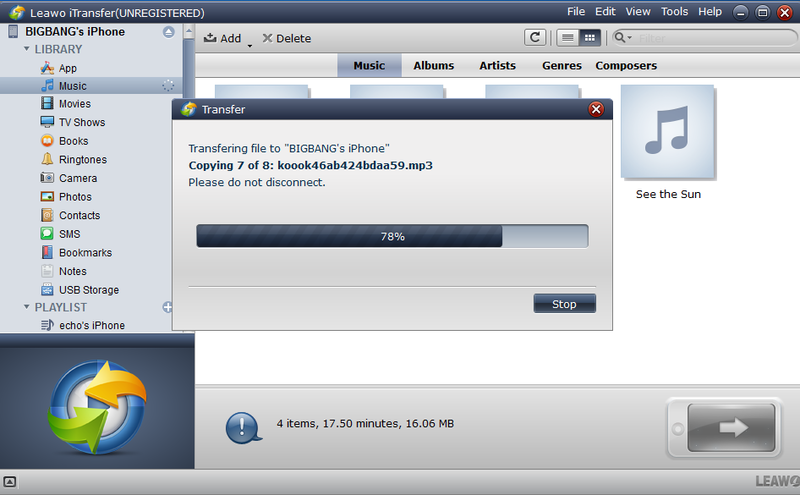 This tutorial will show you how to transfer MP3 to iPod devices with iTunes and professional MP3 to iPod transfer app. Leawo iTransfer is a professional MP3 to iPod transfer software app that could help you directly transfer MP3 to iPod touch/shuffle/nano/classic from your computer. It bypasses iTunes, therefore you even don’t need to import MP3 files into iTunes for transfering to iPod devices. ☉ Up to date iOS is supported for data and file backup and transfer. The below step-by-step guide would show you how to transfer MP3 to iPod with Leawo’s MP3 to iPod transfer software. Beforehand, you need to download and install this MP3 to iPod transfer software on you computer. Under the iPod device tab, open "Library > Music" successively. Then you could add MP3 files into this MP3 to iPod transfer app for transfering. You could right click the "Music" tab to choose "Add File" or "Add Folder", directly drag and drop MP3 files into this panel, click the big blue "Add File" button, or click "File" on the upper right corner, and choose "Add > Add File/Add Folder" to add MP3 files from local drive. Once you’ve finished choosing MP3 files for adding to iTransfer, this MP3 to iPod transfer app would start to transfer MP3 to iPod device directly. With Leawo iTransfer, you could transfer multiple data and files like music, video, photos, etc. between iOS devices, iTunes and computer. Also, as a dual-way iOS data transfer app, you could transfer MP3 and other data/files from iPod and other iOS devices to computer as well. If you’re using a Mac computer, you could make use of Leawo iTransfer for Mac. Of course, Apple iTunes could also help you directly transfer MP3 to iPod devices for free. You could add as many MP3 audio files as you want to iTunes for transfering to iPod devices. The below steps would show you how to transfer MP3 to iPod with iTunes. Firstly, launch iTunes and then click the "File" menu. 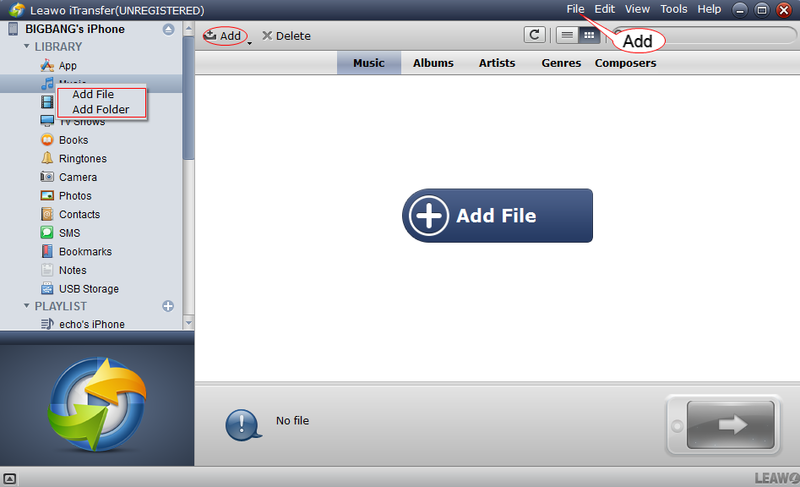 Choose "Add file to Library" option to add MP3 files from local drive to iTunes music library. Connect your iPod device with computer via iPod USB cable. Then you will see your iPod device is listed on iTunes. 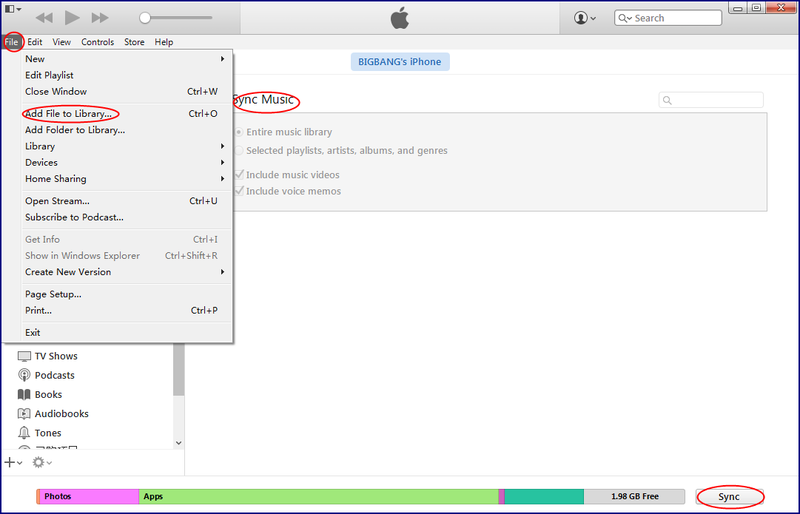 Open your iPod on iTunes and go to "Settings > Music" option. Then you could select which to transfer from iTunes to iPod. After selecting, click the "Apply" button at the bottom right corner. iTunes would start to transfer MP3 to iPod, as well as other music files. It is obviouse that iTunes offers free service for you to transfer MP3 to iPod, while Leawo iTransfer is a paid shareware app that requires you to purchase license and register before you could fully enjoy its features. However, the advantages of Leawo iTransfer are also easy to see: it could directly transfer MP3 to iPod, no need to importing MP3 to iTunes; and, it doesn’t sync the entire music library from iTunes to iPod, but only the MP3 files you want to transfer to iPod. The biggest advantage of Leawo iTransfer is that you could use it to transfer data and file from iOS devices to computer, even those you haven’t purchased, like music and Cameral Roll photos, which is not supported by iTunes.